Easy to create. Easy to manage. Our elfs will get back to you with more information. 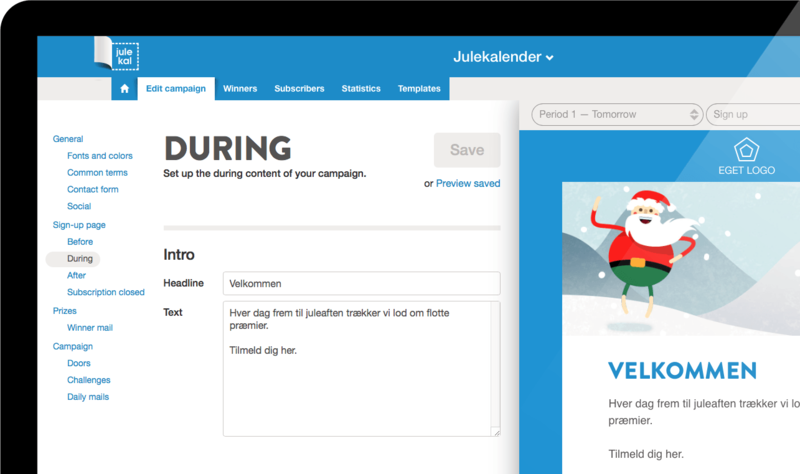 Capture visitors on your site with a competition, or use the Christmas Countdown as a central part of your Christmas communication. Convert social media users to mailing list sign-ups. Use email as a much cheeper and effective way to target your messages to individual users. By asking the right questions, you can target your messages better. All answers you collect can be exported or synchronized live. Each touchpoint can carry your sales pitch. Conversions typically happens after 5 touchpoints or more. Your campaign is next to ready, even before you get started! Simply upload your graphics, and place your questions, and you are ready to go! Colors, typography, pictures and every piece of text can be updated to your preference. We can even make changes to your HTML template for special requests. Set up your prizes as you like. Find a winner among correct answers, participants in a specific period of time, or a number of other scenarios. You can even use our lottery ticket system for your main prize to award participants more chances for each correct answer in the competition. Follow your participants on our detailed statistics page. Integrate your campaign with Google Analytics and track the users as they continue to your own website. If you ask for zip code and age on sign up, you can see the location and age distribution of your participants. Insert a tracking pixel on your website and see each sale or registration generated by your campaign. At anytime you can export a list of all your new permissions as a CSV-file. You can include all their data including answers and import them into your own email database or CRM-system. Improve conversions with customized sale opportunities for your subscribers based on sign up fields, answers or web hooks. The subscribers scratch to participate and immediately can see if they have won. Let your subscribers gift their friends with a better chance of winning by signing up via their personal link. Let the subscribers look for the periods challenge on your website. It is easy to set up. Let your subscribers gift their friends with a better chance of winning by letting them sign up via the personal link. Create a fun personality quiz, where your subscribers as an example could find out which of the reindeers their personality matches. Insert a code snippet on your website, and the advent calendar sign up form pops up on your website. The system marks each period and question if there is for instance missing a correct answer. Making it easier to see if all your prizes are set up correctly and how they are distributed. Every subscriber gets a personalized sharing link and the opportunity to share it in an email or social media directly in the campaign. See which of your users are the top influencers. Give access to parts of the administration interface to everybody at your company without the need for username or password. New overview of who receives which notifications from the system. See which devices and IP-addresses that has logged in with your user credentials. Added a progress bar on the dashboard for signups if you have enabled a limit. Sign up fields can now have default values. The latest subscriber list on the Subscribers page is now auto updating. Ask multiple questions in succession. Embed a tracking pixel on your own website and follow the users from the competition to your own website through ordering and purchases. Discover how multiple exposures throughout your competition slowly but surely persuades leads to become customers (attribution marketing). See which users has confirmed their email address by opening a mail or clicking a link. The confirmation status is exported in your CSV-file. Sync new leads directly to your CRM tool. Conditional web hooks that only activates if certain conditions are met. If you already have the name and email address for a user, e.g. when linking to the signup page from a newsletter, you can now pre-fill those fields. We have been using Julekal for several years, with great succes. The system is flexible and easy to manage, and it can withstand the pressure of our thousands of subscribers. Therefore, of course, we have chosen Julekal again this year. Why use Julekal and not just Facebook? We recommend using Facebook as a channel for exposure and a Julekal campaign with daily emails to capture leads and ensure repeat visits. Most often the conversion from lead to customer happens after several exposures to your sales message. Daily emails encourages the leads to come back to your campaign every day in a cost effective way. While social media and AdWords get all the attention at the moment, don't forget that email can be an extremely cost effective sales driver. According to leading experts, email use is much closer to the purchase decision than other channels. A fact the makes it essential not the neglect your email strategy. An important aspect in successful email campaigns is to target your customers to increase relevance. Use your Julekal campaign not only to get more permissions, but also to learn more about your subscribers. For other inquiries call us +45 70 70 13 17 and get a quote. Get better conversion rates by creating customized sales opportunities for your subscribers when they participate. Segment your subscribers into personas based on the sign up form, quiz answers or web hooks. Let the subscribers scratch to participate, and let them immediately see if they have won the prize. You choose wether it should be the periods sole activity or as an integrated part of the quiz. Choose which sociale media the subscribers can share their personal link on after participation and follow who are the Top Influencers. You can reward a sign up via a personal link by giving out extra lottery tickets as an incentive. All from selecting winners, notifying them and the support team, to replacing the sign up page after the campaign ends can be automated with Julekal. All you have to do is enter your content into the system and we will take care of all the hard work. Almost half receives emails on a mobile unit, and the tendency keeps increasing. Both our web- and email templates are fully responsive, and works great on both mobile devices and desktops. Choose if your prize should be selected between all correct answers, all contestants during a given period of time, or give a winning lottery ticket for each correct answer. Julekal has all the possibilities — you decide. With Julekal you can always keep track of detailed user statistics. By placing your Google Analytics account, you can integrate the statistics, and track the participants journey as they move on to your own site. Add the sign up page for your Advent Calendar to your Facebook page. The contestants will still receive a daily email — it decreases the drop outs and makes your online campaign more effective. Wether you have 100 or 500.000 sign ups for your campaign makes no difference... In fact the more sign ups you have, the cheaper the price gets. 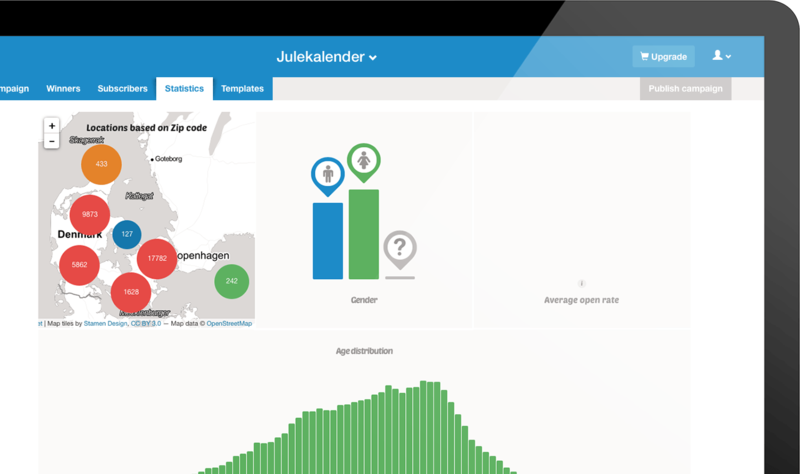 Julekal is hosted in the cloud on servers with at least 99.9 % uptime. Our servers can easily handle 100.000 subscribers in ten minutes... Can yours? If you link to your own website, it can be a good idea to send out the reminder emails over the course of hours so your systems can keep up. This is simple to set up in Julekal. Use web hooks to fetch additional information about your subscribers or for live updating your CRM with new subscribers. When the campaign is finished you can download a CVS file with all the contestants and their answers. It makes it easy to import the leads directly into your own email database. If you are a technically advanced user you can use Julekal as the backend engine, and create your own HTML templates from the bottom up. You can even add a small CMS which makes it easy to edit the campaign content. A small percentage of users will always have questions. Maybe they unsubscribed by mistake, or they misspelled their email address. Julekal gives your costumer service access to search among the contestants to help them correct possible errors. You can integrate campaign sign ups in banners and on campaign sites by using Julekals simple API. You can also request a "call back" to your own API for each sign-up. It is easy. Perfect for printed material. Your users signs up for the Christmas Countdown by sending a SMS with their email address. This way they never even have to visit the webpage. Julekal is designed to create a finished and ready-to-go campaign by using very few graphics and settings. You can find a guide on how to design the material in our Help Center. Campaigns has 8 years of experience, and has already sendt out more then 44 million emails. We therefore have a large know-how regarding online campaigns.